The singer, 27, was deemed a “phenomenal success” by The International Federation of the Phonographic Industry (IFPI) who awarded her with the global artist of the year prize. 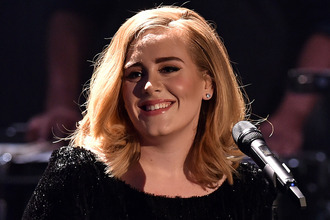 Adele achieved the feat despite not releasing her third album, 25, until November 20. She also refused to put it on streaming sites. The album became the fastest selling in British history and sold 800,000 copies in its first week. The album’s debut single Hello had success in the UK and across the pond where it became the first single to be downloaded more than one million times in one week. Swift, who won the award in 2014, fell to number three. Ed Sheeran took second place despite not releasing an album in 2015. Justin Bieber - who released his latest album, Purpose, in November - was placed fourth while One Direction placed fifth following the success of their final album before embarking on an extended hiatus.